The Chicago Teachers’ Union has done it again! They have gifted us yet another sharp tool for our public school support kit. 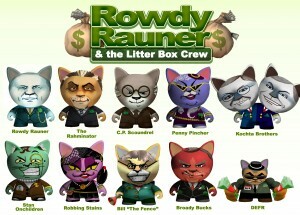 This time it’s a spot-on satirical cartoon skewering on Chicago’s corporate reformers. Dangling at the end of the lampoon are some of PURE’s favorite goofballs: Penny Pritzker, Bruce Rauner, Robin Steans, Stand for Children, and, of course, Mr Secret Sauce himself, Mayor Emanuel. CPS called the video “mean-spirited.” OK, more mean-spirited than closing schools and sending students to worse alternatives? Not tracking these students as promised? Flunking students based on one test score when the test is not designed for that purpose, and when flunking usually hurts more than it helps? Ignoring a state-mandated facilities committee that had gone a long way towards holding CPS and the city accountable for their unfair funding decisions, then replacing it with a “commission” that claims it will truly this time trust us listen to the community, as it holds last-minute pseudo-hearings in churches run by Mayoral pals? More mean-spirited that that? It’s just a cartoon, folks. Watch it, share it, enjoy it. We need the laugh. Be merry! PSAT for 11-27-12: Push back on closing extension this morning! 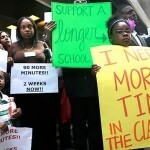 Pressure is mounting on the Illinois General Assembly not to go along with Mayor Emanuel’s ill-conceived request to push back the school closing announcement until March 31 and allow CPS to close up to 120 schools with little time for families, communities, and school staff to prepare for the massive upheaval this will cause. Right now, this morning, you need to contact your state senator and state rep and ask them to vote NO on any extension of the closing announcement deadline. 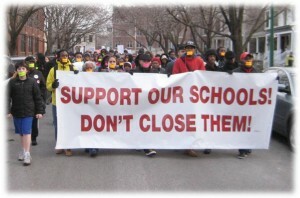 We support a school closing moratorium NOW, not next year after too much damage has been done. We support the recommendations of the Chicago Educational Facilities Task Force, which was put in place by the General Assembly, and whose members will be in Springfield today to speak on behalf of our schools and our children, along with representatives from Raise Your Hand and others. Those of us who can’t be there in person must be there in spirit by reaching out now before the 1 pm hearing! Support our schools! Call your state senator and state representative at his/her home or Springfield office, or use this handy CTU form to send an e-mail now! Posted in Uncategorized | Comments Off on PSAT for 11-27-12: Push back on closing extension this morning! Will Illinois outlaw Noble’s “secret sauce?? "Section 5. The School Code is amended by adding Section 527A-5.5 as follows: (105 ILCS 5/27A-5.5 new) Sec. 27A-5.5. Student discipline; fines prohibited. A charter school may not impose a fine or other financial penalty 9on a student as a disciplinary measure. The amended bill, SB 637, passed out of the Senate Education Committee on a 6-4 vote. Delgado explained to the committee that he knows Milkie well, respects him as an educator and is impressed by the successes. But, he said, “We just disagree about this policy.” Many constituents have complained to him about the fines, he said, and asserted that he “could have filled the hearing room” with opponents of the policy. He also referred to recent media accounts in which students and parents decried Noble’s policy. No public school is allowed by law to charge such fees, Delgado pointed out, and no research has generated findings that such “financial punishment” has beneficial effects. Committee members Sen. Kimberly Lightford (D-Maywood) and Sen. Iris Martinez (D-Chicago) joined Delgado in vigorous opposition to the fines. “I have also heard many complaints,” Lightford told Milkie. We’ll be working in the coming days to help Senator Delgado pass his bill. Posted in Uncategorized | Comments Off on Will Illinois outlaw Noble’s “secret sauce?? To put it all into perspective, let’s look at some numbers. Meanwhile, back at the ranch, Mayor Rahm Emanuel is offering our teachers $3.41 per hour to work an extended day, according to the CTU. Many feel that teachers are just being greedy, and that this is the real problem with schools and society. People like Mayor Emanuel and Arne Duncan are out there every day pushing that very message, with support from Bill Gates and his PR millions. So, it might be a good idea to compare that with the approximately $3,558 per hour Mayor Emanuel made during that amazing 2 1/2 years he was working as an investment banker between gigs in the White House. That’s more than ONE THOUSAND times what he’s offering the teachers for their critical service to our children. Or, we can just get a bunch of new leaders who understand the value of real work. WWRD? 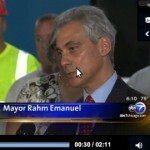 Now Mayor Rahm is giving local ministers the text for their sermons this week. This morning at a clergy event organized by CPS, Father Rahm urged pastors to call for a longer school day from their pulpits on Sunday. Of course, it’s nothing new for City Hall to have a bunch of ministers in its hip pocket, ready to deploy as a front for whatever soul-killing initiative our mayor wants to foist on our most vulnerable communities. 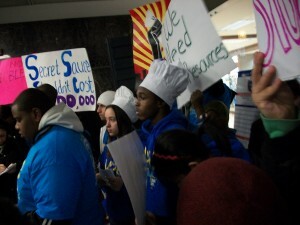 Take that “protest” out in front of CPS during the Board meeting yesterday. There were several ministers and a group of other folks with printed signs demanding not just more time in school but EXACTLY 90 minutes and 2 weeks extra – the very numbers on Rahm-Claude’s scorecard. It’s not that I don’t want a longer school day, as long as there are enough high-quality programs to fill the extra time and enough money to pay for them. But somehow this was never a big deal back when we might actually have been able to pay for it. Somehow during Mayor Daley’s entire tenure as Chicago schools czar it was OK for Chicago to have the shortest school day in the state and possibly the nation. 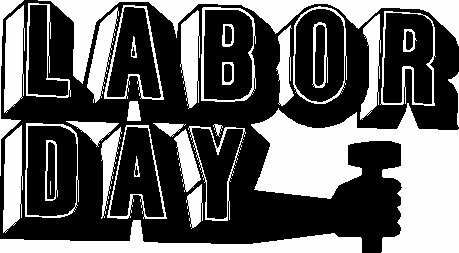 Somehow it’s only a desperate need now, when implementing a longer school day must necessarily involve taking an ax to teacher salaries and other critical programs. Hmmm. Wonder what the real goal is?? ?